Springdale, Ark. — Linen King’s Springfield healthcare laundry facility has received accreditation from the Healthcare Laundry Accreditation Council (HLAC), the industry’s highest rating on quality and safety. 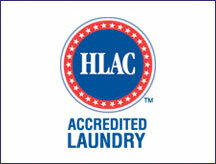 HLAC is a nonprofit organization that inspects and accredits laundries processing healthcare textiles for hospitals, nursing homes and other healthcare facilities. National inspection assures customers that highest quality and safety standards are met. Accreditation requires an independent third party to inspect the laundry provider’s facility and prove it meets or exceeds the standards for processing healthcare textiles. A laundry cannot inspect and accredit itself, and customers do not have the time or expertise to do so. For more information about the HLAC certification, visit www.hlacnet.org.